HomeFab ForumAll together nowWhat Are You Eating Right Now? Currently I have a roast chicken and mushroom pasta bake in the oven, ready in about fifteen minutes. Whole roast chicken that needed using. Mixed wild mushrooms I picked this afternoon. Sweetcorn. Shallots. Dischi Volanti pasta. Passata and toffee apple cider sauce. Smoked Bavarian proccessed cheese grated over the top and just starting to bubble. ^^Oooh that cookie is so cute, I love it! And I think we're all agreed that if there's ever a BB meet-up, RN is cooking, right? To stay on topic: Boring porridge with semi-skilled milk and a dash of sugar. Carrots and hummus. One of the best snacks of all time, in my opinion. 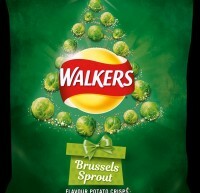 Are those Brussels-sprout-flavored potato chips? In my dreams I’m eating ramen soup with a side of bread and butter. irl, I’m eating saltines and cough drops. They say the stomach flu only lasts 48 hours maximum... but come on, it’s been three days! Oh, well, it’s nice to have the internet to take my mind off of it. Tbh cough drops are good. Whenever I'm sick I eat them like candy. But I'm sorry you're still sick, I hope you feel better soon! Way to call me out on my Americanism, @Ron Nasty . I wonder if they use fries/chips or chips/crisps in Australia. We know of both, and both are used. 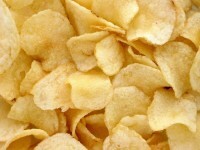 From my experience, chips are used for both types of food. Terry's chocolate orange? They are simply the best possible thing in the world. That's the one! It's been a while since I last had one... I ate half of it before I managed to control myself. I love what it says on the wrapper... "Whack and unwrap." I eat a lot of chocolate... probably too much. I'm ashamed to have read such a sentence! I eat a lot of chocolate... some depraved and soulless people might consider it too much. My doctor/dentist might be appalled to learn how much chocolate I consume, but there's no stoppin' me!!!! Not a big fan of orange flavored chocolate, it's the one chocolate in the box that i don't like. All this talk about chocolate is reminding me of Savoy Truffle . It's no good in a box, then every other chocolate turns orange-flavored. And while orange and chocolate is good, orange and chocolate and white chocolate and key lime is weird.